While Brazilians are big spenders, the Chinese are saving, Indians are study geeks and the Russians are on a downer, brands are looking at exponential growth in emerging markets over the next few years as consumers look to ‘trade up’ in these nations. 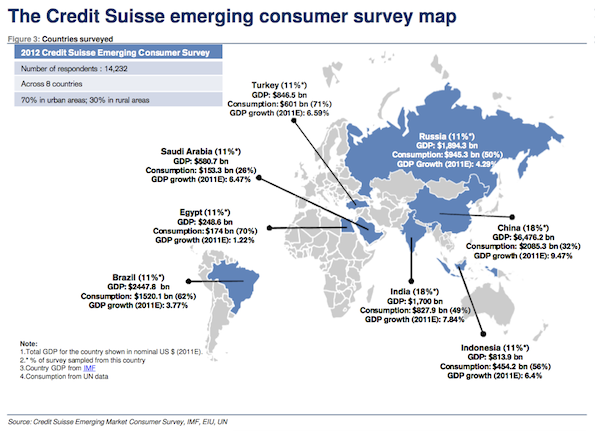 In a look at current consumer behaviour in key emerging markets, Credit Suisse and ACNielsen interviewed 14,000 consumers across eight countries. The study found that while consumer confidence was down among this group overall, behaviour varied greatly by country and brands should not take a one size fits all approach when moving into the emerging world. However, as wealth grows, one thing these markets are expected to have in common is a trading up from unbranded to branded products, a trend that will benefit overseas brands which are seen as pre-eminent and something to aspire to. The mix of local and international brands varies by category, with local brands still holding sway in dairy and personal products categories, Credit Suisse says. The report identifies three key opportunities for international brands. One of these is capitalising on the trading up trend, while the others are scope for merger and acquisition in categories where local brands dominate and opportunities to invest in local brands poised for growth. Brazil: The Brazilian consumer stands out as the most optimistic across the survey, with one of the highest rates of income growth among the countries surveyed. Given a consumer that typically spends rather than saveing (barely 7% of income is registered as saved), it remains a market for momentum in discretionary spending (smartphones, technology, personal care). Key stock recommendations: AmBev, Brasil Foods, Natura, Diagnósticos da América,PDG, Multiplus, MercadoLibre, Procter & Gamble, Diageo, Yakult. China: The outlook for the Chinese consumer is robust though expectations have softened in the last 12 months and optimism is lower than in Brazil and India. The strength of technology spending is a clear bull theme while a prioritisation of healthcare and education also stand out. Key stock recommendations: China Modern Dairy, Belle, 7 Days, BMW, Swatch, Wynn, Tencent. Egypt: Optimism in Egypt is the lowest in the survey accompanied by low spending levels. The key is finding the stability and means to unlock it. At present, and politics aside, ongoing real declines in income do not provide long term opportunities. No stock recommendations. India: Indians are confident in their future personal finances and spending in most consumer categories, particularly low ticket. There is an appetite for extra investment in education and technology spending as internet penetration continues to grow from a low base. Key stock recommendations: Educomp, HDFC Bank, Hero, Sun Pharma, Prudential. Indonesia: The Indonesian consumer displays strong structural growth potential and high optimism. There is considerable potential to unlock under-penetrated markets such as automobiles (cars and motorbikes) and technology. Key stock recommendations: Mitra Adiperkasa, Indofood CBP, XL Axiata, Daihatsu, BATs. Russia: “The weakest BRIC in the wall,” Russia has the lowest optimism of the group. The simple explanation stems from poor income growth but it seems unlikely that this lid on optimism will be removed easily. The outlook for growth may be better in high ticket items due to the severe income inequality and under-penetration of luxury goods and technology. Key stock recommendations: Magnit, Sberbank, Synergy, Philip Morris, Crown, JTI. Saudi Arabia: The government’s spending plans and policy announcements have been highly supportive of confidence. Spending outlooks should remain discretionary focused (smartphones, computers, property and cars). Key stock recommendations: Almarai, Etihad Etisalat, Yum! Brands, Nokia, BMW, Apple. Turkey: Turkish consumers are feeling the squeeze, with week consumer confidence. Food and housing costs are squeezing out discretionary spending and leaving limited funds for saving. With the outlook for real incomes still questionable, this does not look a market for high ticket spending. Key stock recommendations: Efes, Arcelik, Tofas, Reckitt-Benckiser.